Geneva, 23 November 2015 - The increased involvement of organized crime groups and on some occasions rebel militia, has changed the dynamics of combating wildlife and forest crime. The International Consortium on Combating Wildlife Crime (ICCWC) was formed to ensure a formidable and coordinated response to such crimes and to assist law enforcement authorities around the world with the increasingly difficult and complex situations they face in their fight against this highly destructive criminal activity. Five years after the signature of a Letter of Understanding on 23 November 2010, the five inter-governmental organizations that form ICCWC, namely the Convention on International Trade in Endangered Species of Wild Fauna and Flora (CITES) Secretariat, INTERPOL, the United Nations Office on Drugs and Crime (UNODC), the World Bank and the World Customs Organization (WCO), celebrate the 5th anniversary of the launch of the Consortium. Globally, there is strong recognition of the need for increased international collaboration and coordination to combat illicit trafficking in wildlife. United under ICCWC, the five organizations have a unique pool of thematically relevant technical and programming expertise, that present the opportunity for a novel approach to the multi-facetted challenges posed by wildlife crime. Since its creation, the important role of ICCWC has been widely recognized, most recently by the UN General Assembly adopted Resolution on Tackling Illicit Trafficking in Wildlife, which includes a recognition of ICCWC and acknowledges the valuable technical assistance ICCWC can provide to support member states efforts to tackle illicit trade in wildlife. Mr John E. Scanlon, CITES Secretary-General, said: “ICCWC is developing the tools and providing the coordinated support and services that countries need to enable them to confront the organised criminal groups that are driving industrial scale poaching and smuggling. It is giving front line officers combating wildlife crime the ability to deploy the same tools and techniques used to combat other serious crimes, which is essential if we are to win this fight”. “The Consortium has benefited from the strong support of the executive heads of each of the five partner organisations, and generous financial support from multiple donors, including the European Commission, the Netherlands, Norway, Sweden, the United Kingdom of Great Britain and Northern Ireland, the United States of America and the World Bank Development Grant Facility, for which we are most grateful. This has enabled the Consortium to deliver a wide range of activities to date” added Scanlon. Based on the Consortium’s Strategic Mission, ICCWC partners are providing coordinated law enforcement support in many different countries and regions across the world, to enhance the capacity and compliment the efforts of national wildlife law enforcement agencies and sub-regional and regional networks that on a daily basis act to combat the illegal trafficking in wild fauna and flora. Key activities delivered under the auspices of ICCWC include the development and implementation of the ICCWC Wildlife and Forest Crime Analytic Toolkit. To date Toolkit implementation has been successfully completed in 6 countries and is at different stages of implementation in an additional 11 countries in Africa, Asia, Europe and Latin America. Further requests for toolkit implementation continue to be received. An ICCWC indicator framework for wildlife and forest crime, designed to be completed as a self-assessment of national capacity for law enforcement authorities has also been developed. This indicator framework will complement the Toolkit, and will be launched at the 66th meeting of the CITES Standing Committee in January 2016. In addition, ICCWC has coordinated a number of operations such as INFRA TERRA, PAWS and URSA, and supported network-led operations such as COBRA II and III. 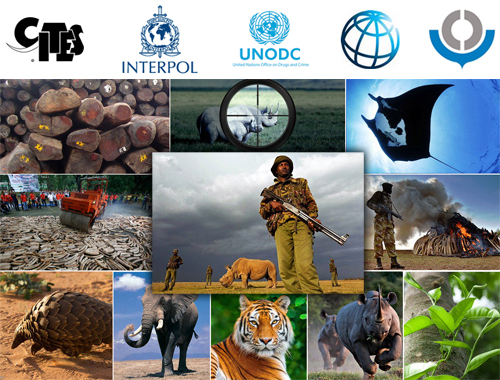 Following the convening of the First global meeting of wildlife enforcement networks at the 16th meeting of the Conference of the Parties to CITES in Bangkok, Thailand, and to further enhance cooperation and coordination among networks, a second global meeting is planned alongside the 17th Meeting of the Conference of the Parties to CITES in September 2016 in Johannesburg, South Africa. As part of ICCWC’s portfolio of activities on wildlife forensics, ICCWC developed practical tools and guidelines such as the ICCWC guidelines for forensic methods and procedures of ivory sampling and analysis, and is currently developing similar guidelines for timber. ICCWC is also developing an anti-money laundering learning programme with a specific focus on wildlife crime, which is expected to be ready by mid-2016, for the training of investigators, prosecutors, judges, and other relevant stakeholders involved in the investigation and prosecution of wildlife crime cases. ICCWC has contributed to generate high level support to combat illegal trade in wildlife by supporting and organizing a number of high level conferences and events such as a seminar for Heads of police and Customs on tiger crime, the ICCWC Ministerial roundtable on combating wildlife and forest crime, and a Ministerial-level and Senior Officials meeting on combating poaching and the illegal trade in rhinoceros horn. 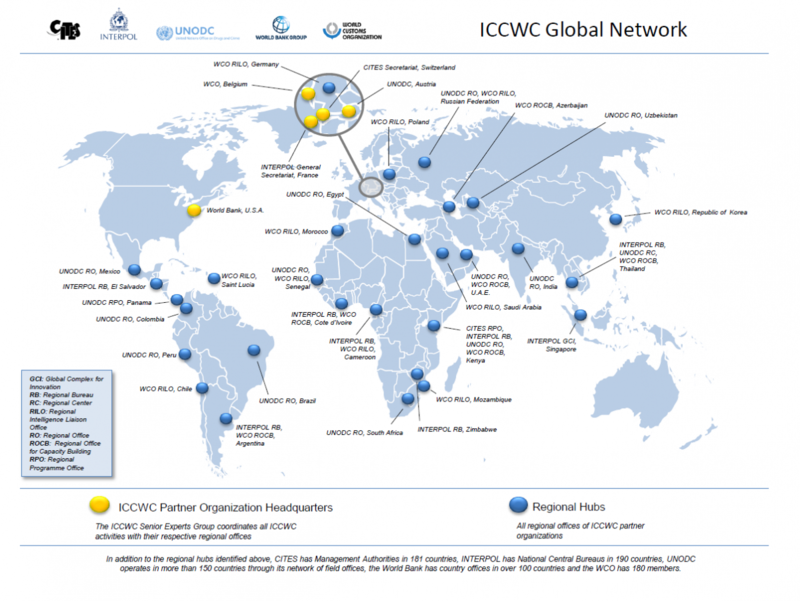 The Consortium uses a light administrative model, with ICCWC partners leading on key initiatives. Building on its current Strategic Mission, ICCWC will be launching in coming months its Strategic Programme for 2016-2020, the Consortium’s targeted strategy to combat illegal trade in wildlife in a comprehensive and coordinated manner for coming years. The Consortium would like to thank the European Commission, the Netherlands, Norway, Sweden, the United Kingdom of Great Britain and Northern Ireland, the United States of America and the World Bank Development Grant Facility for their generous support to ICCWC. For more information, please visit the ICCWC website. The mission of ICCWC is to usher in a new era where perpetrators of serious wildlife and forest crime will face a formidable and coordinated response, rather than the present situation where the risk of detection and punishment is all too low. In this context, ICCWC works for, and with, the wildlife law enforcement community, since it is frontline officers who eventually bring criminals engaged in wildlife crime to justice.